International football tournaments follow a fairly predictable script. The two most predictable scenes, after England failing to live up to the hype and the Dutch being eliminated on penalties, are the precocious young player who impresses and the small country that captures the hearts and minds of casual fans. When Euro 2012 kicks off this weekend in Poland and Ukraine, those looking for an underdog to support and a young player to discover need not look any further than Denmark and their young star Christian Eriksen. There are many reasons to support both. The Danes have lost more finals matches in the Euros than any other team, but in 1992 they became the unlikeliest of European champions when, after replacing Yugoslavia, they went from not qualifying for the tournament to winning it. They defeated the Netherlands, reigning European champions at the time, in a semifinals penalty shootout and notched an unexpected 2-0 win against the then-reigning world champions, Germany, in the final. Fast-forward 20 years and the tiny Scandinavian nation finds itself once again drawn against Germany and the Netherlands, along with Portugal, in Group B, dubbed the tournament’s “Group of Death.” The Germans and the Dutch are two of the favorites, and in Cristiano Ronaldo Portugal has the best player in the tournament. Denmark is fully expected to be the whipping boy, and each match will be an uphill battle. If there is a silver lining for Denmark it’s this: They finished above Portugal in the same qualifying group. If they can beat Portugal (more on this later) and somehow find a way to get two points from their matches against Germany and the Netherlands, they will be marching on to the quarterfinals. 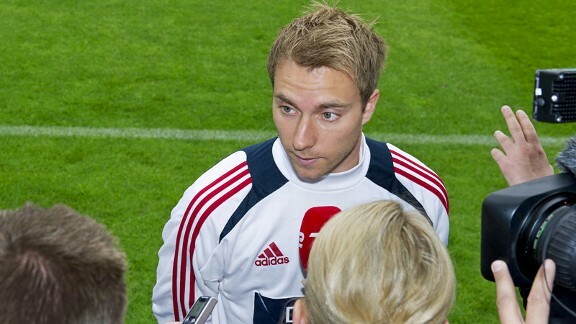 If Denmark is to survive the group of death, they will need Eriksen to make the jump to the next level this summer. In Eriksen, Denmark boasts one of the finest young prospects in Europe. He is the kind of technically gifted two-footed player you enjoy watching because he has the confidence to try things most players won’t. Whether it’s dribbling past three defenders in tight spaces, a back heel pass inside the box, or a shot from 30 yards while running at full speed, he can do it all. Unlike many young players who move to the bigger leagues before they are ready, Eriksen has remained in the Dutch Eredivisie league and his game has improved annually. Last year he was named Danish footballer of the year and Dutch Football Talent of the Year in the 2010-11 season. Eriksen will face the toughest competition of any player in his age group — Bastian Schweinsteiger (Germany), Mark van Bommel (Netherlands), and the mercurial duo of Ronaldo and Nani (Portugal) — and because of it we will all leave the tournament with a good idea of just how good he is and can be. In years past the Netherlands was the team most neutrals supported. After switching to a more defensive style in the last World Cup they stopped being lovable losers. Denmark will probably be the small country that comes closest to emulating the Dutch style with their open, attacking, entertaining football. When minnows play against the big nations, they either defend for 90 minutes and hope to steal a goal or attack, get torn apart, and walk away knowing they entertained the crowd. Denmark will be somewhere in between. They won’t be naïve enough to attack for 90 minutes, but don’t expect them to be timid. Denmark’s attack is a combination of quick passes out to the wings, the ball moving briskly from defense to attack, with striker Nicklas Bendtner serving as the focal point. Look for Dennis Rommedahl, Michael Krohn-Dehli, and Eriksen to be prominently involved, too, with Daniel Agger joining the attack from defense. Denmark has the players and will line up in the kind of formation that lends itself to an entertaining match. The only question is whether they will leave themselves too vulnerable against the firepower of the other teams in their group who each have one of the top three goal scorers from the qualifying campaign. You might ask yourself what Leo Messi, an Argentine Barcelona maestro, has to do with your interest in Denmark. Bear with me. The constant comparison between Messi and Ronaldo is tedious but at the same time unavoidable. Their zero-sum game means that any loss for Ronaldo in this tournament is a gain for Messi. That’s just the way it is. Messi scored 73 goals this season (in all competitions for his club) on his way to capturing three trophies with Barcelona, but neither of those included the two most important ones, La Liga and the Champions League. Ronaldo inspired Madrid to the La Liga crown. Both Barcelona and Real Madrid were eliminated in the semifinals of the Champions League. If Ronaldo takes Portugal on a run to the finals this summer, there is a good chance he will regain FIFA’s Ballon d’Or, given to the world’s best player. Messi fans should jump on the Denmark bandwagon, because if Denmark can defeat Portugal it will almost certainly ensure that Ronaldo doesn’t make it out of the group stage and Messi will retain the honor for a fourth consecutive year. Messi fans should all be lining up for seats on the Denmark bandwagon this summer. You don’t have to watch much soccer to know Ronaldo or Rooney, but when you tell someone you are cheering for Denmark they will automatically assume you know something they don’t. It’s like my friend who doesn’t watch any soccer, doesn’t know a free kick from a free sandwich — but put him within earshot of a soccer conversation and he will drop his signature line that he heard once on the BBC: “The problem with Arsenal is that they try to walk it into the net.” If you want to get your soccer weight up, here are a few lines. If you find yourself in a bar with a group of soccer snobs and Denmark is playing, tell them, “I really like the way Denmark switches from 4-5-1 to 4-3-3 when they have the ball.” If Eriksen pulls off a sublime move, simply chime in, “You know, he really reminds me of Laudrup,” pause for effect, then continue, “Michael, not Brian.” During the national anthem the camera usually pans across the players in uniform. When it settles on Bendtner, just blurt out, “Look at Bendtner. His ego is bigger than his talent.” If things start to go south for the Danes, pound your fist and yell, “This wouldn’t happen if they still had Stig Tofting in the midfield!” But if you are against faking it, grab a cold pint of Carlsberg and sit back and enjoy the show. Is Derek Fisher More Important Than We Think?